The Lion Alcolmeter® SD-400 provides fast, accurate, fully quantitative breath alcohol analysis along with a range of readily available options. 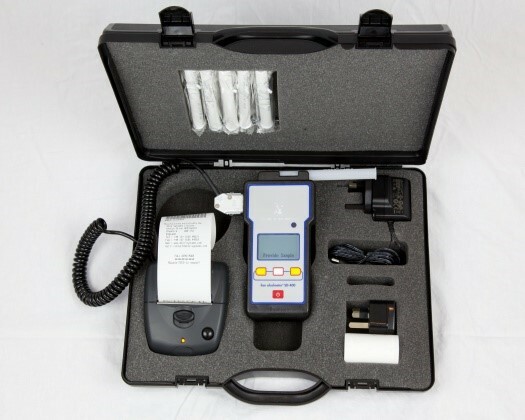 This Australian Standard (AS3547-1997) approved instrument uses, is extremely robust, simple-to-use and ideally suited for alcohol breath testing in law enforcement, medical/healthcare, workplace health & safety and industrial environments. This automatic instrument is ready for use within 10 seconds of switch on, provides an easy to read response within 5 seconds and re-sets ‘ready’ to take the next breath alcohol sample in as little as 10 seconds. As a data-logging instrument the internal memory ensures that last test re-call is readily available as well as providing the capability of exporting all sample data along with the respective date and time for external use. Powered by 5 x AA alkaline batteries, the SD-400 breathalyser will provide at least 2500 breath tests per set of batteries. The SD-400 can be programmed to provide quantitative results through the use of either a single-use, hygienically sealed mouthpiece tube or passive “talk-into” testing via a reusable sampling cup for fast, low cost, non-invasive sampling process. This instrument is fully configurable and will allow “Pass/Fail” results if required. In accordance with the Australian Standard AS3547:1997 the Lion Alcolmeter® SD-400 is required to be recertified every six months to ensure accuracy. Lion Breathalysers Australia and our approved Calibration/Certification Agents are the only “manufacturer (Lion Laboratories Limited) authorised” calibration/recertification facilities within Australia/New Zealand/PNG and the South Pacific. To ensure your instruments are maintained to the highest possible standard and accuracy please call us to confirm authorisation of your intended service provider. SD-400 Printer Kit: [Order No: 400-PKIT] This combines all the analytical power of the Lion Alcolmeter® SD-400 with a small, rechargeable, thermal printer. The SD-400 combined with the Printer Kit is configurable to allow input of subject/witness name area for signing, date, time, location is ideally suited to workplace health and safety environments where a printout of either all or positive only breath alcohol test results can be provided to employees at the time of sampling. The SD-400 can simply be disconnected from the printer for independent use.